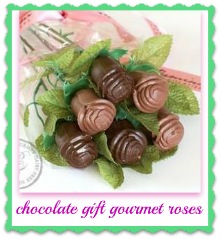 What's the difference between chocolate gift gourmet style and just regular ol chocolate? Remember that and you'll be able to pick the perfect gift. When you select chocolates for her birthday you better make sure there's a dash of romance in every bite. Romance and chocolate has gone together since Adam and Eve...or maybe Romeo and Juliet. Whichever, it's still happening now more than ever. Here are a few ways you can add the love to chocolate. Surprise her with personalized chocolates. 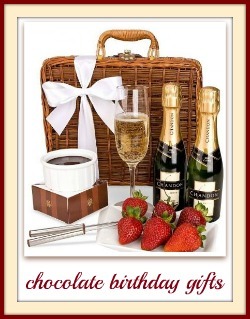 Include delicious wine or champagne with her chocolate gift. Include beautiful flowers with her chocolates. 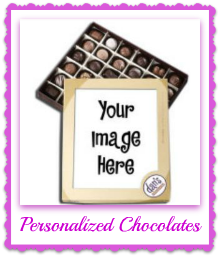 Treat her to some deliciously fresh and scrumptious truffles in a beautifully personalized photo box. You can upload a special picture which will then be made into the top of the candy gift box. This will be a box she's keep for sure once the candy is just a memory. Or, have the personalization put directly on the candy. Either way this is a wonderful birthday gift. Add either wine or champagne to a gourmet surprise. It really makes it more romantic! I've found some beautiful baskets and also chocolate that has wine as one of the ingredients. You can also give these as only one of her gifts. The other gift can be a romantic evening out or a cozy picnic. Have you ever heard of chocolates made with wine? I hadn't until I found these gems. They are actually made with some of the finest wines in California! My favorite state! In fact, a few are made in Santa Cruz where I used to live. The wine gives the chocolate a unique rich taste she will love. Chocolate and flowers go together like hugs and kisses. I can't decide which I like better - flowers or chocolate. Well - flowers last longer and chocolates taste better! So I guess there's really no contest! Well, here's to her perfect celebration. I hope I've helped you make it a success by sharing the most luscious chocolate birthday gifts for her!